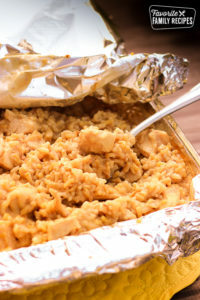 Easy Chicken Casserole isn't only easy to make, it is easy to clean up! Just throw away the foil lining and cleanup is done. Easiest weeknight dinner ever. Pour remaining soup mixture over chicken and rice. Be sure the rice is completely covered. Remove aluminum foil cover from the pan. Use a wooden spoon to stir the casserole before serving. Be careful not to tear the foil on the bottom of the pan.